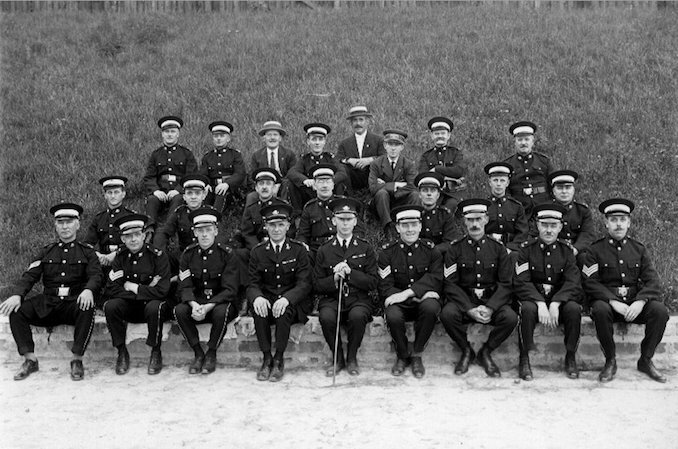 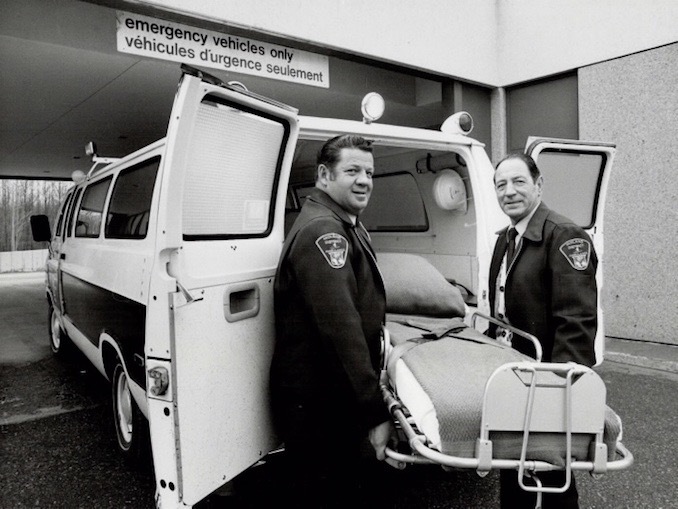 We have shared an album of police officers, one of firefighters and their trucks, this week we are sharing vintage photographs of paramedics and their vehicles over the past 100 years. 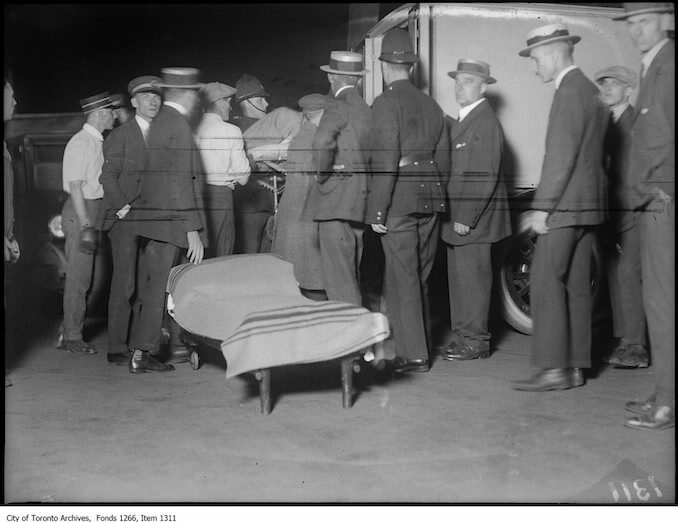 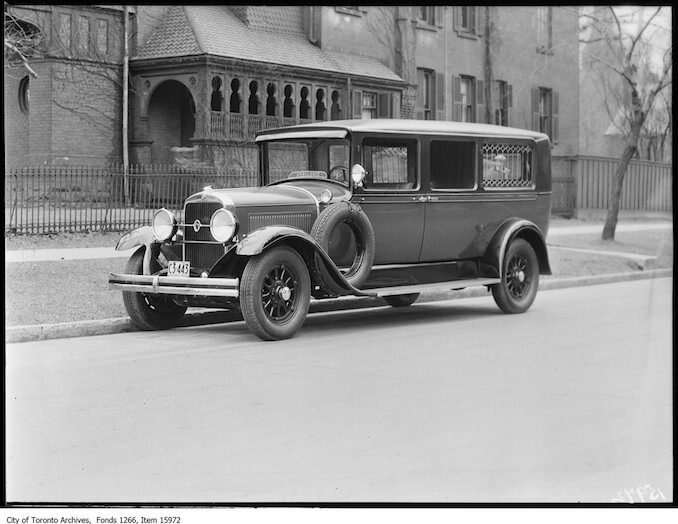 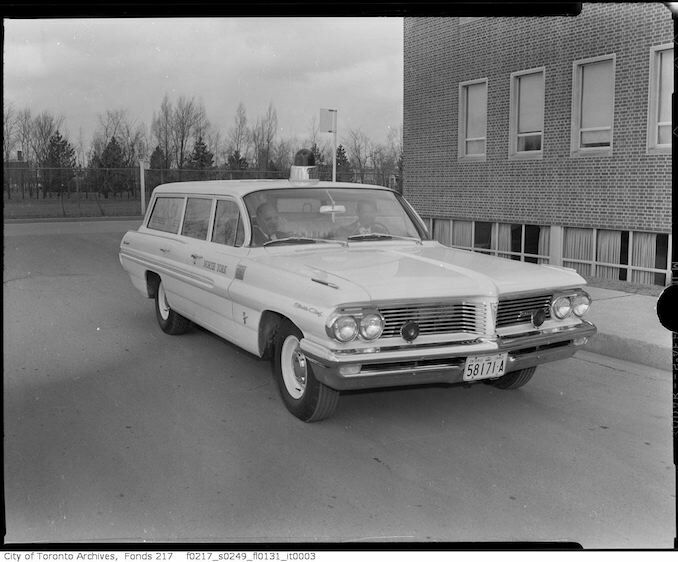 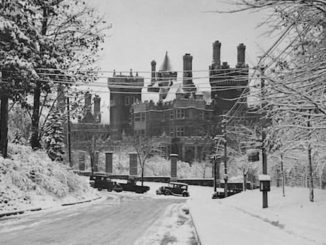 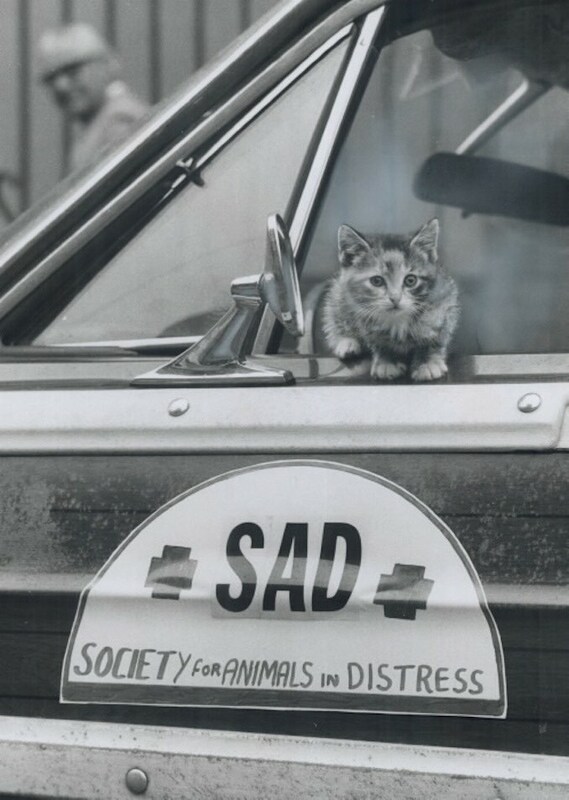 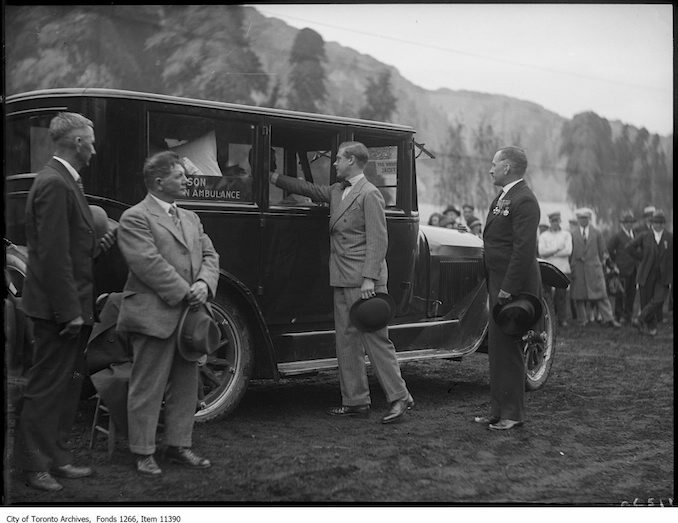 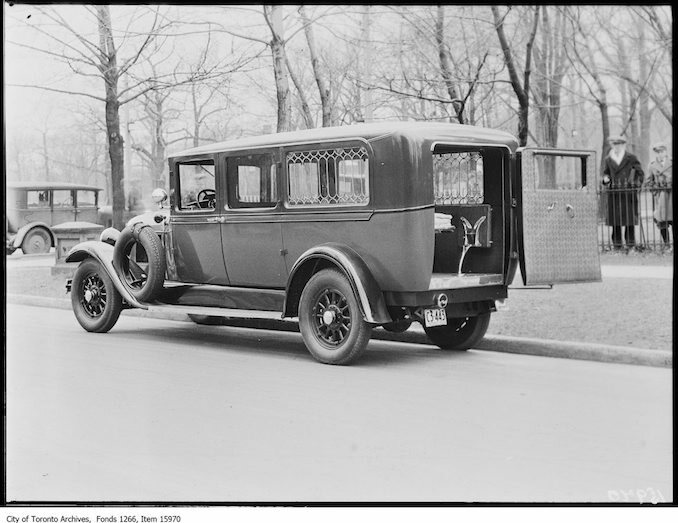 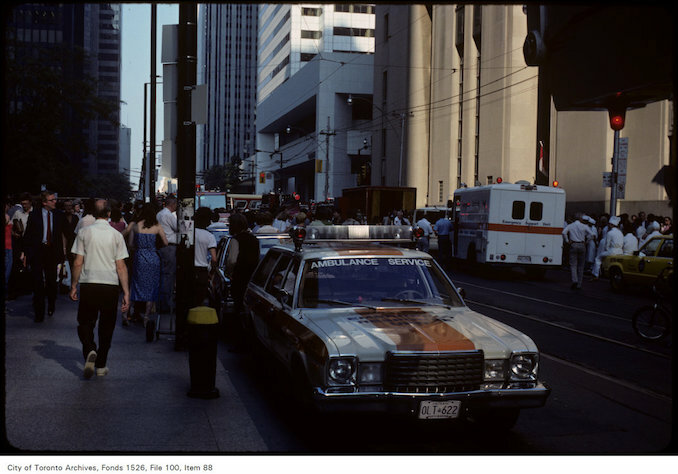 We love searching through the Toronto Archives and the Toronto Public Library Digital Archives to find a glimpse of our city’s and our province’s past. 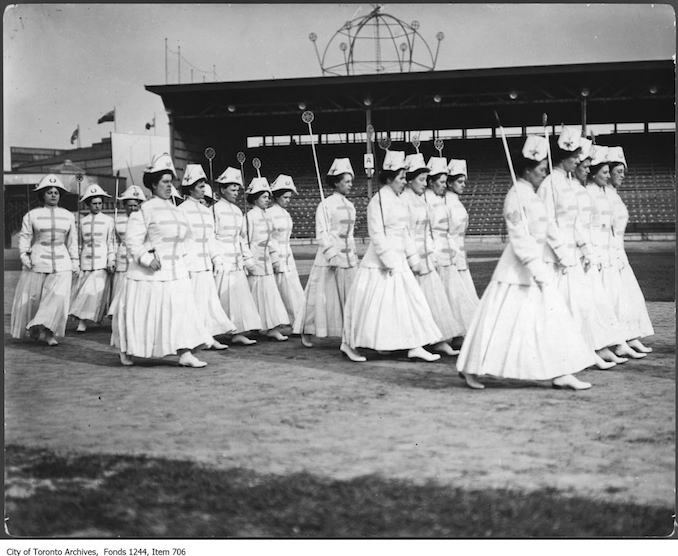 For each post, we choose a subject and then see what kinds of images we can find to share. 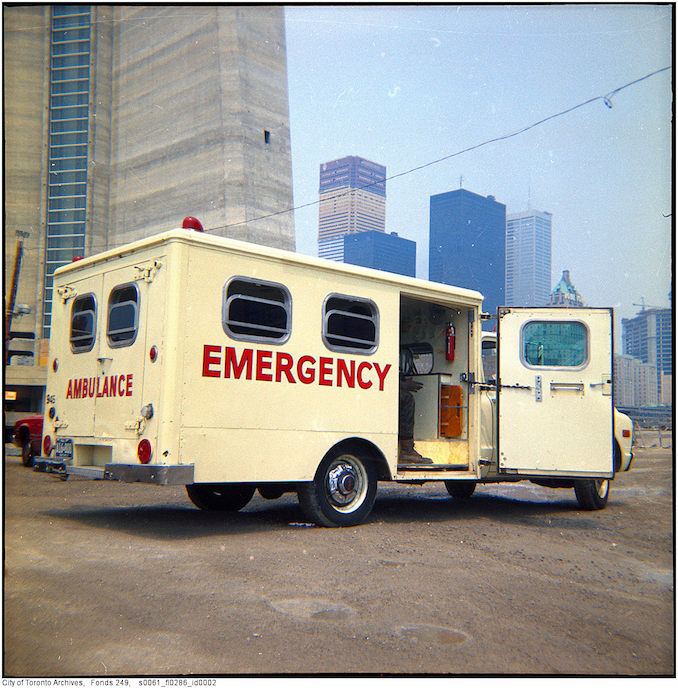 Many images are available for sale if you wish to make them a print for your home. 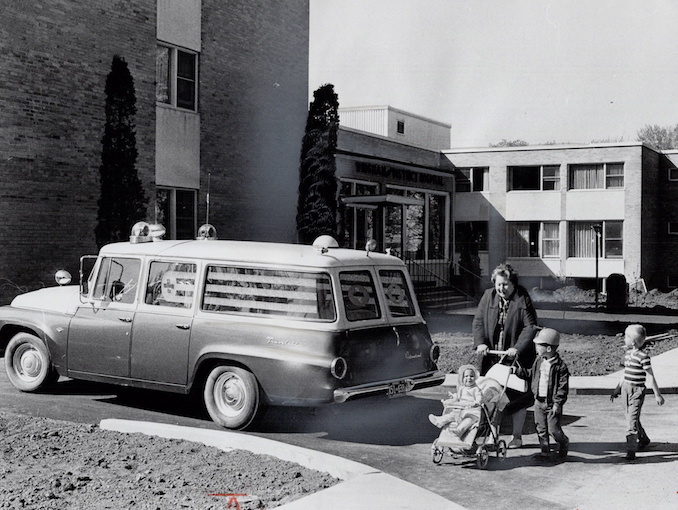 Let us know what interesting things you see in the images via social media. 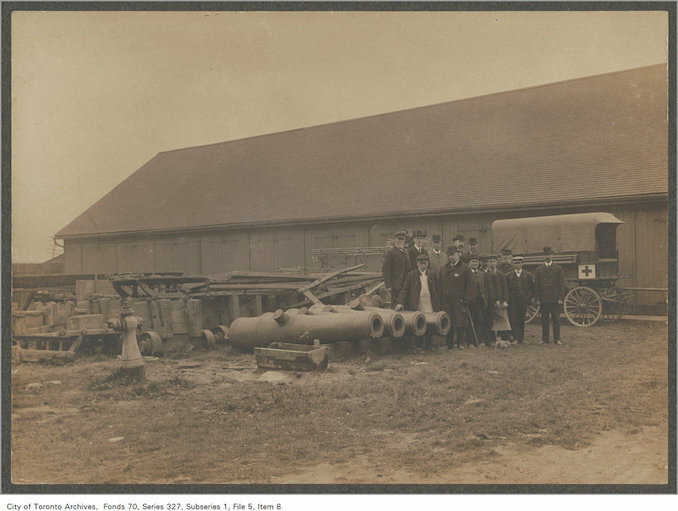 1911 – The Manchester of Canada, Oshawa illustrated. 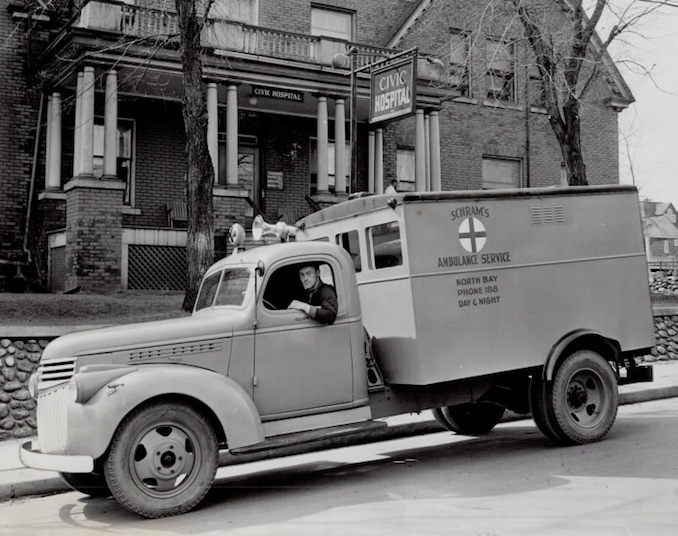 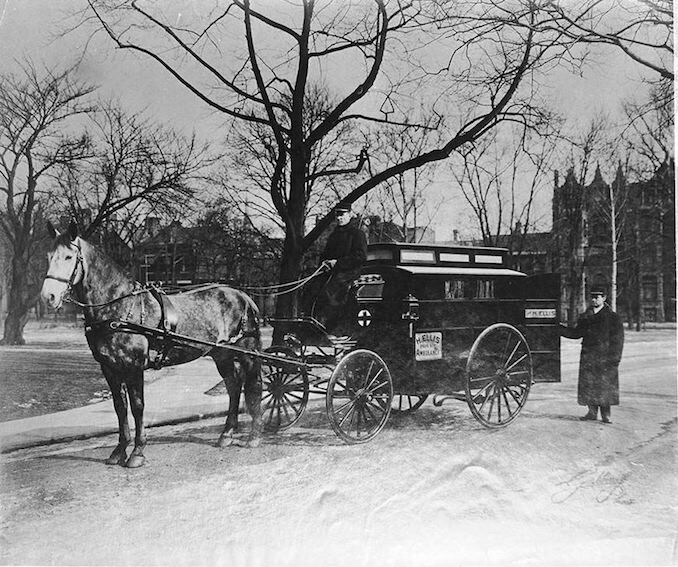 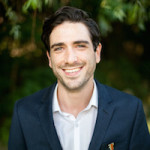 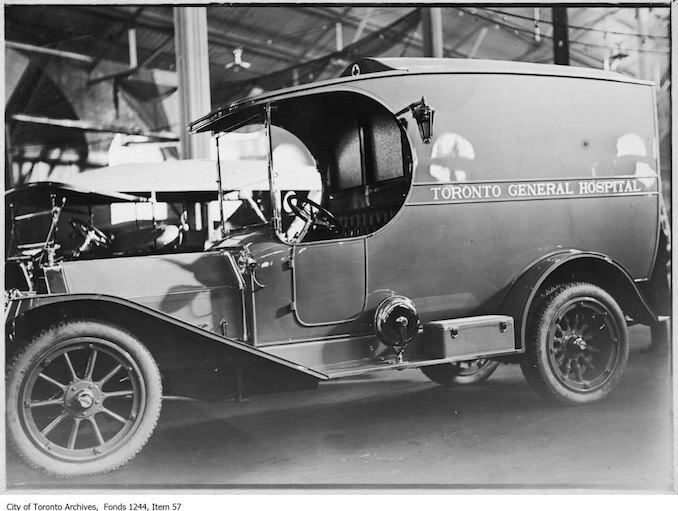 1946 – Kevin W Moore – city council was considering the purchase of an ambulance when Schram arrived to solve the problem. 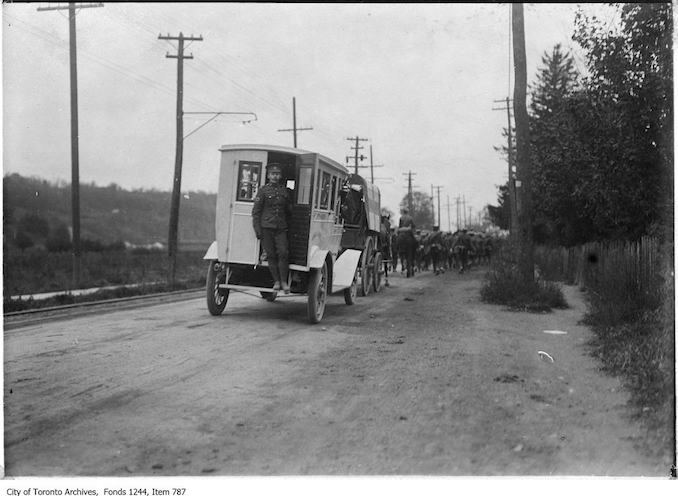 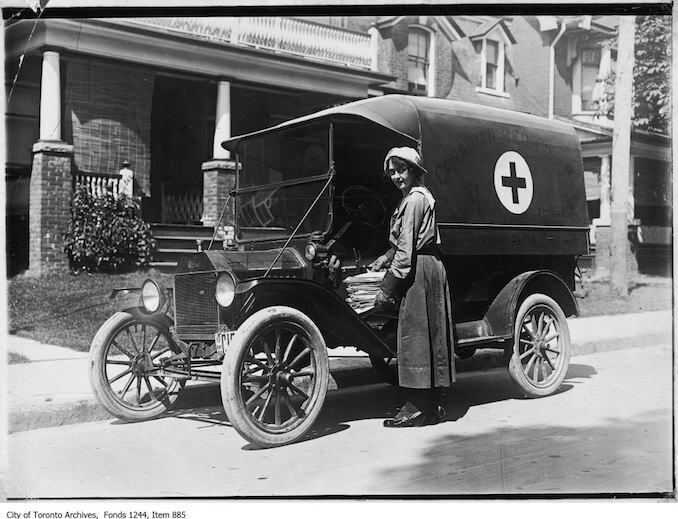 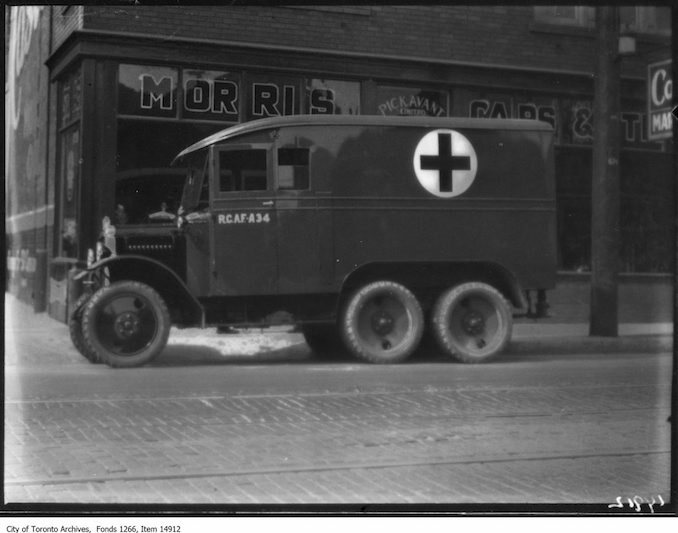 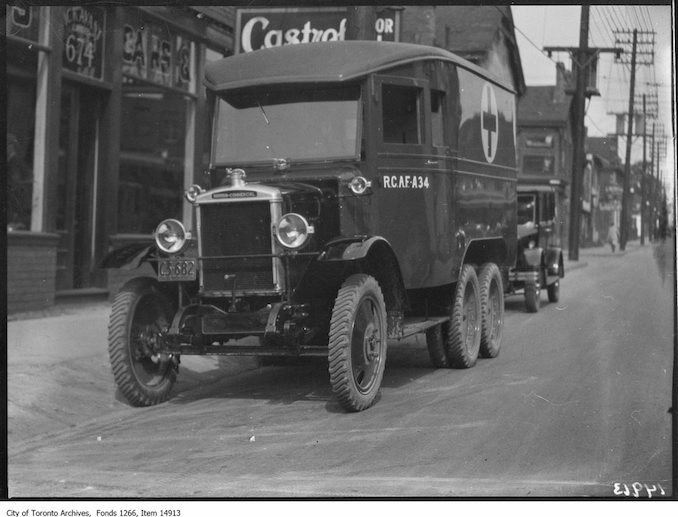 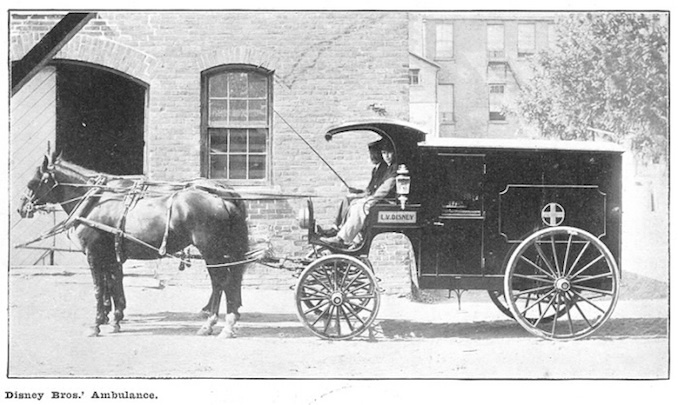 Using his army re-establishment credit and gratuities; he purchased this Red Cross ambulance. 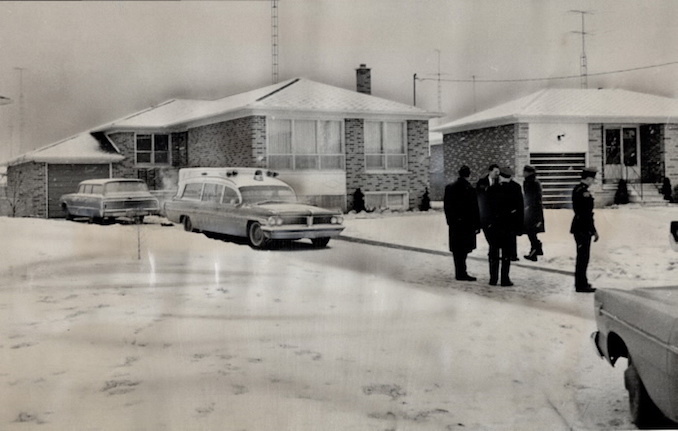 1967 – Boris Spremo – Ambulance and police are shown outside the Sherman Court bungalow where Salvatori Sammy Triumbari; 45; was gunned to death at dawn today. 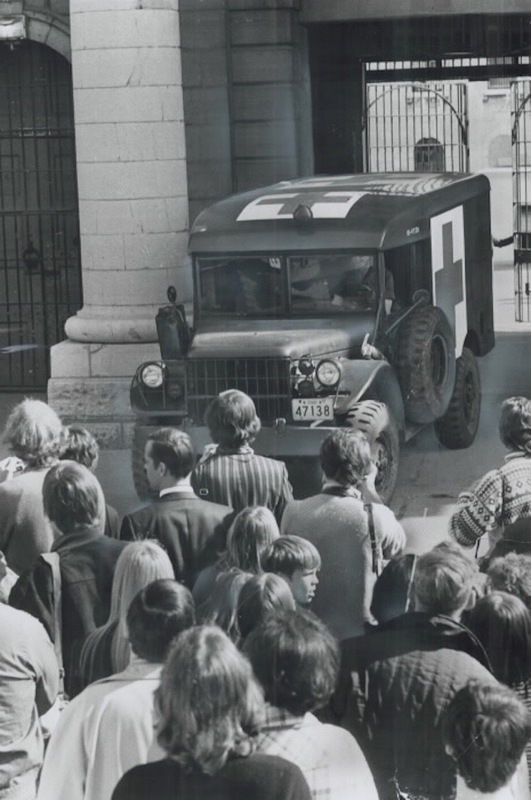 1971 – Fred Ross – Injured convicts found inside Kingston Penitentiary after 500 convicts ended their rebellion yesterday are brought out by ambulance. 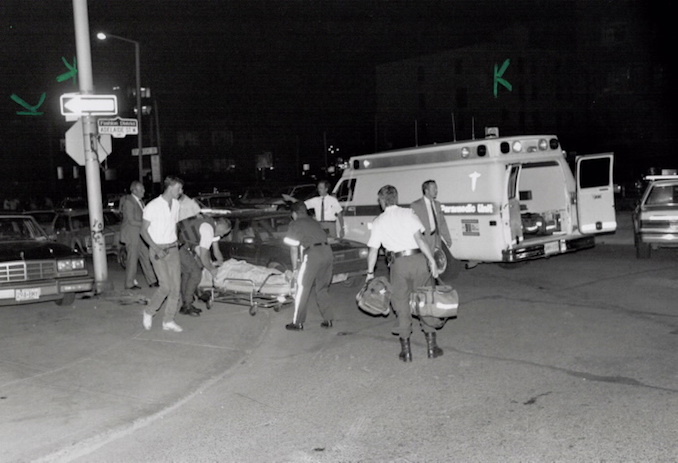 One inmate was found dead; and 11 were injured; apparently by prisoners; before the riot ended. 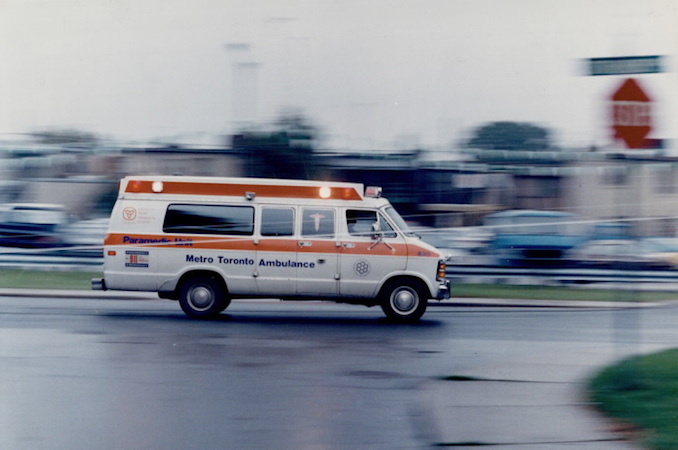 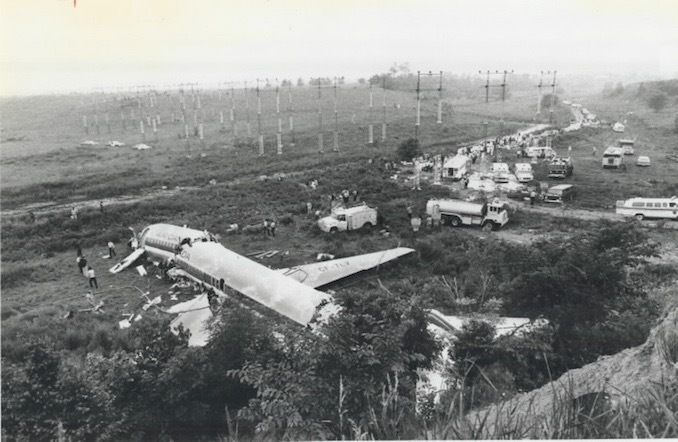 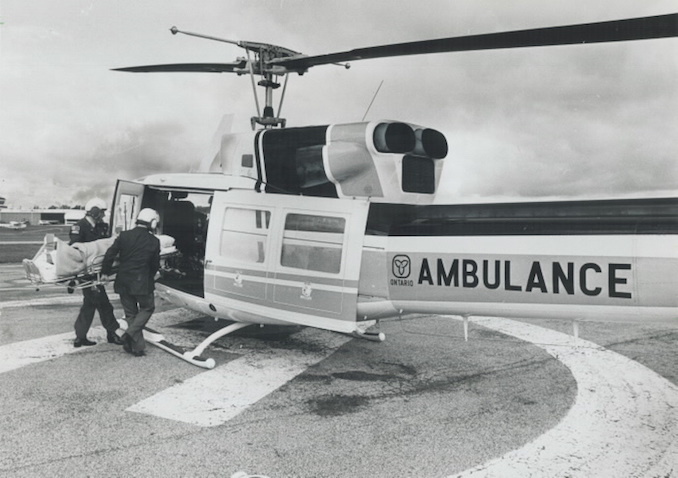 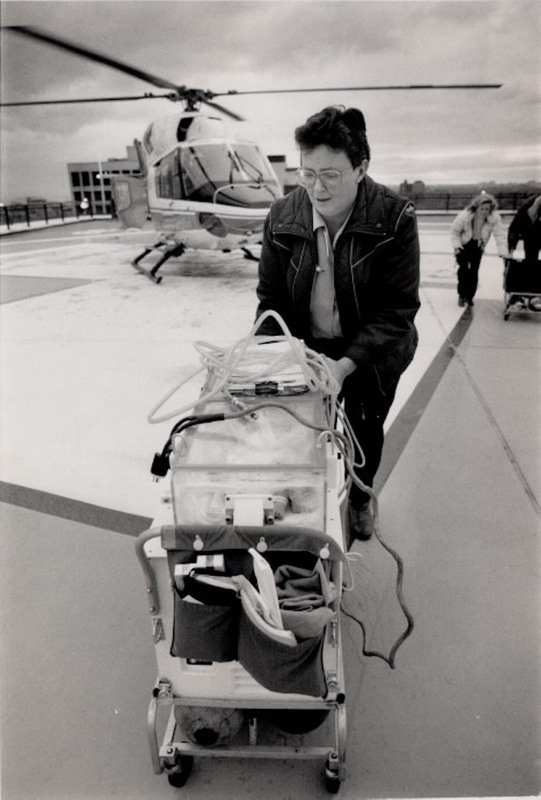 1977 – Colin McConnell – Emergency patient is loaded onto a government ambulance for transport to a Toronto hospital. 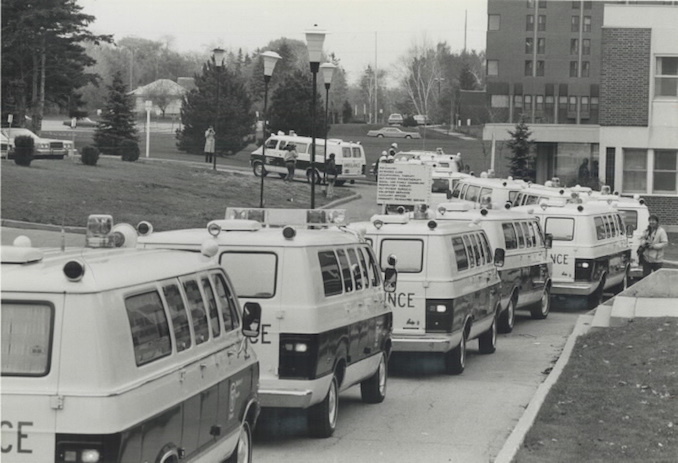 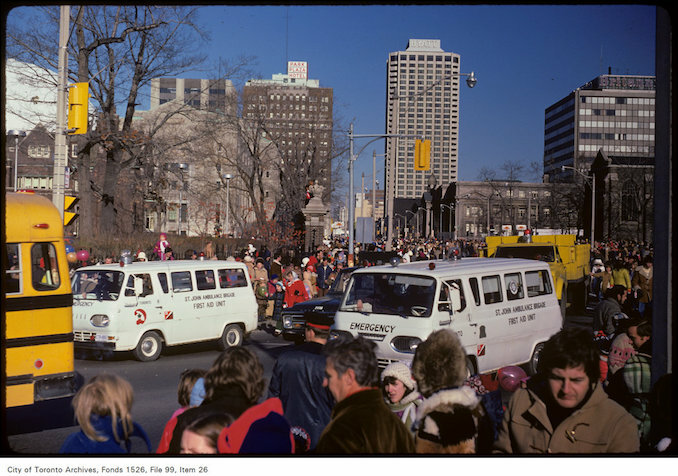 1979 – Jeff Goode – Some of the more than 85 ambulances; from as far away as Kingston; wait in line yesterday to move out patients from Mississauga General Hospital. 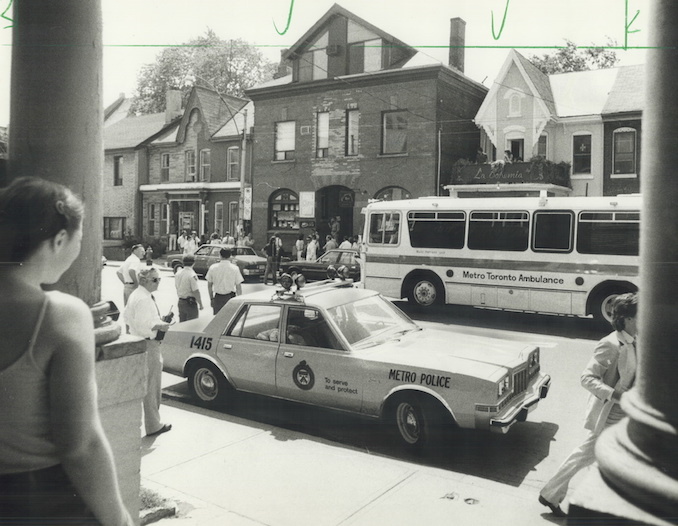 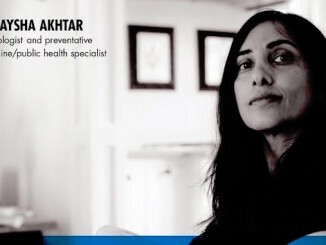 1983 – Don Dutton – An ambulance bus was on hand yesterday when Metro police, after a lengthy undercover investigation, raided Dr. Henry Morgentaler’s abortion clinic on Harbord St. at 11.30 a.m.
1989 – Ambulance workers, a nurse and a policeman wheel Sofia Cook, 23, of Brampton into Toronto General Hospital yesterday after she was shot by police. 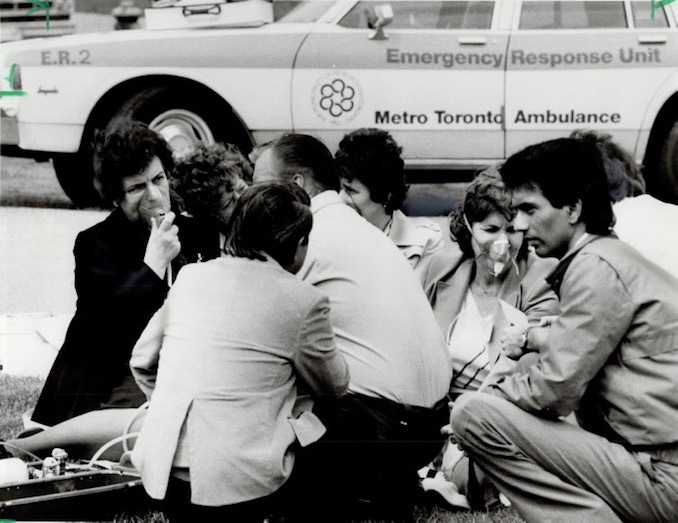 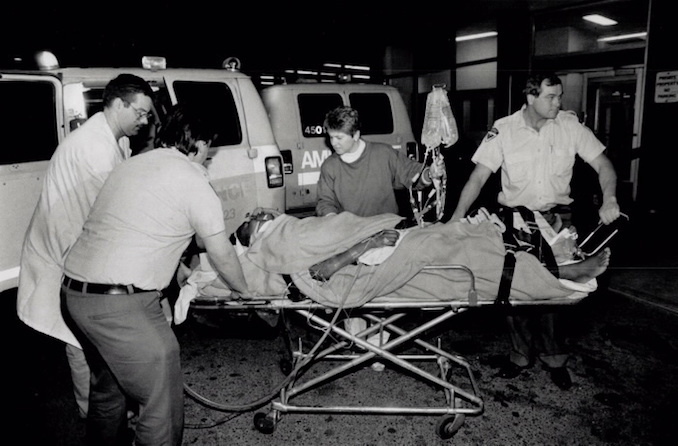 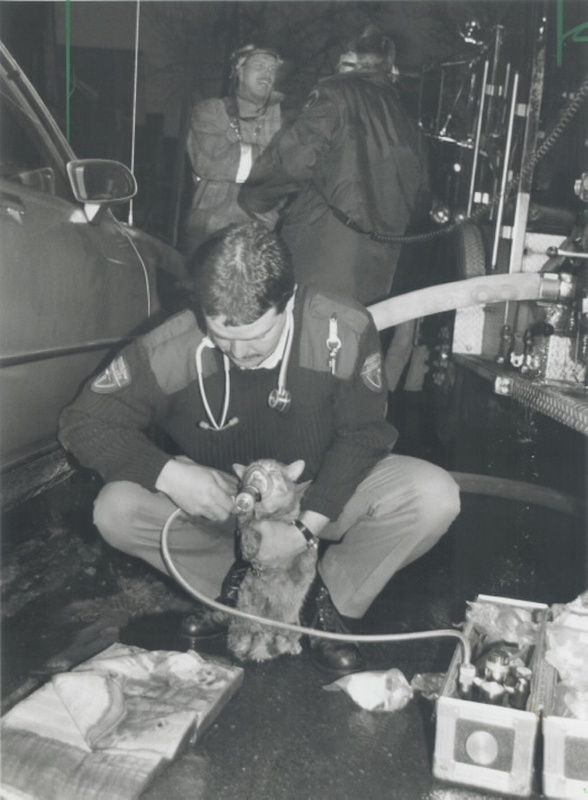 1991 – Don Dutton – Police officers and attendants take wounded officer to waiting ambulance that took him to Toronto Western Hospital last night. 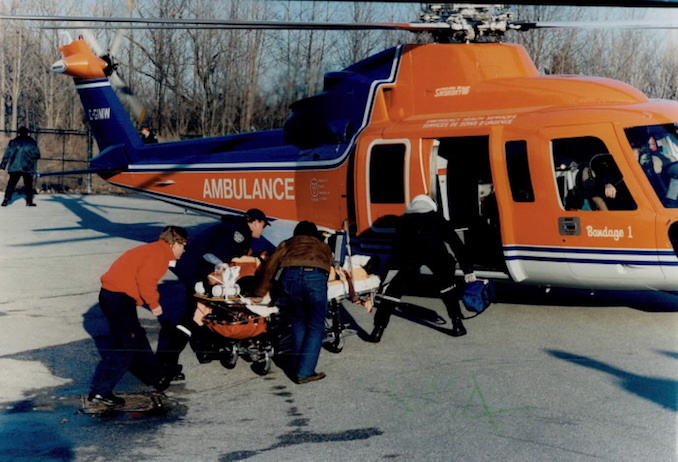 1996 – Henry Stancu – Ambulance crews load an injured man into an air ambulance yesterday at Black Creek Pioneer Village at Jane St. and Steeles Ave.
Find more images on the Toronto Archives and the Toronto Public Library Digital Archive.